UXWeb has changed how users build websites on their mobile and tablet devices. Creating a website builder for touch devices wasn’t an easy task, but with the new Drag & Drop feature, in combination with the Grid, it is now possible to build websites with gestures and direct editing. 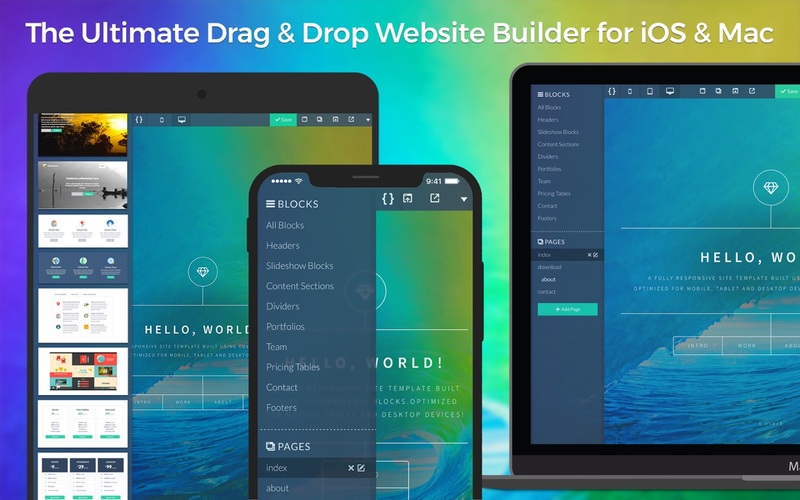 It’s like a desktop builder for your iOS device. Never again will you have to worry about editing code and cross-checking your layout to get it just right. Now, with UXWeb, you can move objects and edit them directly on the page. If you do want to get into the nitty-gritty aspects of code, we’ve included a built in HTML / CSS / JS editor directly into the platform. Edit your website in both desktop and mobile modes to preview how they look in both responsive layouts. All pre-made blocks are designed and developed with the latest HTML5 and CSS3 standards so that they appear pixel-perfect on all device resolutions. Furthermore, they’re retina ready to look beautiful on every screen type. Next story PullTube 0.11.3 – Video downloader. Previous story WebSnapperPro 2.0.3 – Capture entire Web pages as single images or PDFs.